Our Sharknose model was planned for a long time, and that time was well spent collecting the data to make it as authentic as possible. There are no Ferrari Sharknose cars still in existence, so information had to be obtained from photographs and drawings in books and periodicals of that period. Gathering Information I was extremely lucky to know Kane Rogers personally, who already had a wealth of information compiled on this particular car. Kane is an incredible artist, who has built a fine reputation over the years, in his specialized field of automotive art, and a perfect example of his talent is featured above. 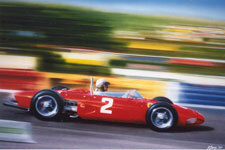 This painting was an inspiration to us, as it depicted the actual car that we were creating, the Phil Hill 1961 F1 World Champion's #2 car. Kane has been our consultant on this project, since it's conception, and invaluable to us in ensuring absolute accuracy with the details. 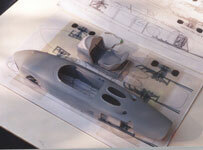 Building the Prototype To begin, we produce our own detailed drawings, from photographs and artist's impressions of the actual car. 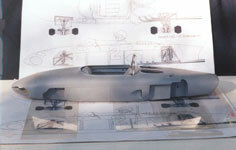 From these, we make the fins and formers from 1/16" plexiglas sheet, to form a skeleton of the body. We then fill the cavities with plexiglas and auto body fillers, until we have the desired shape. 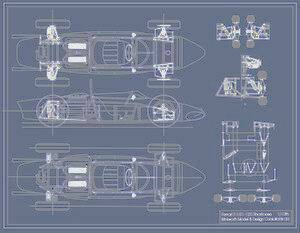 Details The upper and lower suspension "A" arms, steering rods, drive shafts, and shocks etc. are cast in urethane, with a steel or brass wire core to maintain stability. There are no "lift off" engine covers, but the engine detail is visible on this particular car, on both sides, just forward of the rear wheels, and through the two mesh domes behind the driver. Cockpit has, seat, shift and dashboard details Wheels are fully detailed with all spokes inserted individually, and tires have the authentic tread pattern, as run on that car. 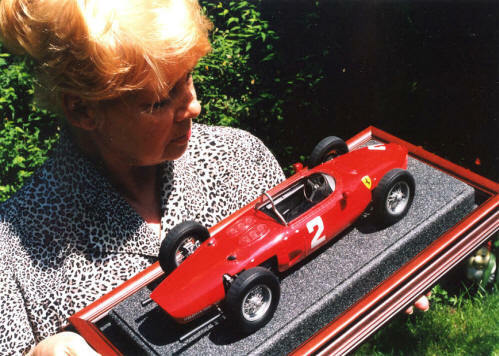 The model above was the first prototype to be built, and was shipped to Ferrari in Italy, to seek authentication, and the possibility of endorsement by Ferrari. It was examined and after discussions with them, it was decided not to pursue the endorsement at that time. 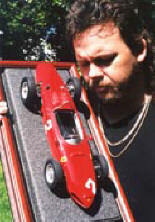 For a small family business like ours, we could not have produced the amount of models to justify the costs involved, in the Ferrari endorsement. You might want to check out our Phil Hill Award sculpture, which we produced from this model. It has been awarded each year since 2006 by the "Road Racing Driver's Club" and will continue to be awarded each year until 2030.